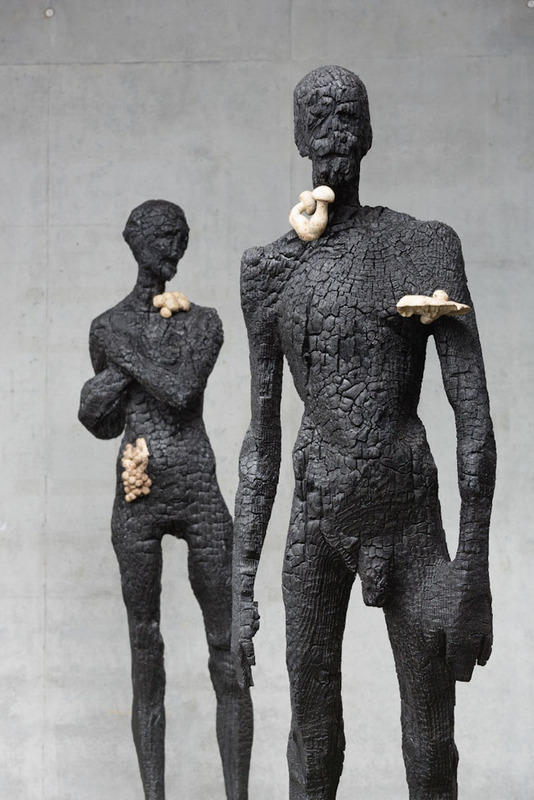 Italian sculptor Aron Demetz (cousin of Gehard Demetz, whose work we featured in Hi-Fructose Vol. 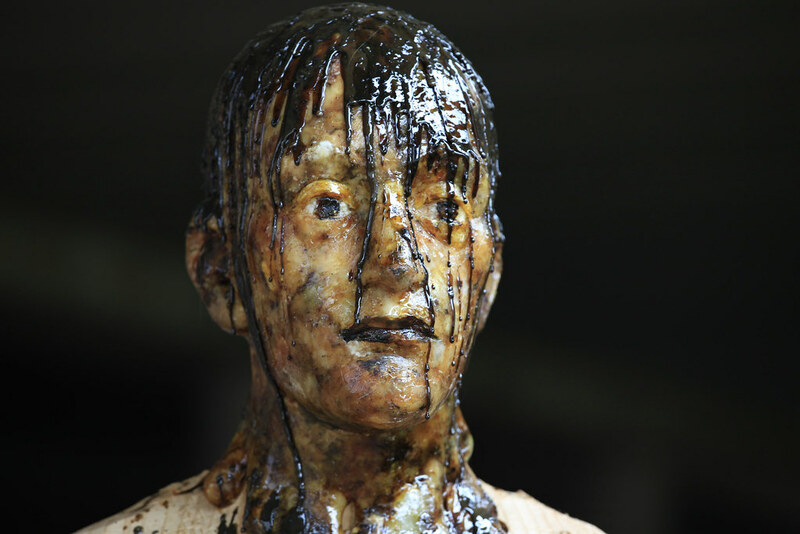 22) creates wood sculptures that appear distressed, burnt and scarred. The process of working with wood is a fundamental part of Demetz’s aesthetic — instead of presenting polished and perfected works, Demetz celebrates the wood’s textures and its transformation through various natural processes. The simplified, abstracted human figures can seem like personifications of the wood itself. Aron Demetz uses traditional woodcarving techniques to convey his preoccupation with humanity’s relationship to nature. In his work he eschews the classical opposition of human and nature, and allows the two to become an inseparable whole, evoking the primordial experience. Born in Val Gardena, in northern Italy, where he continues to live and work, Demetz adopted a traditional South Tyrolean technique of woodcarving that dates back to the 17th century. His sculptures – depicting the human figure in classical postures or unusual awkward positions – explore the possibilities and limitations of wood as a material. The resulting works have a strong physical presence, which deeply engage the viewer on a psychological level, conveying both our oneness with nature and our alienation from it. In the piece ‘Untitled’, conceived for the Italian Pavilion at the 53rd Venice Biennale, Demetz introduced the use of natural resin, meticulously collected from wounds on the trees in the Val Gardena forests. With its smell, colour, and texture, it gives his signature wood sculptures even more corporeal presence and adds a lyrical dimension to his powerful work. 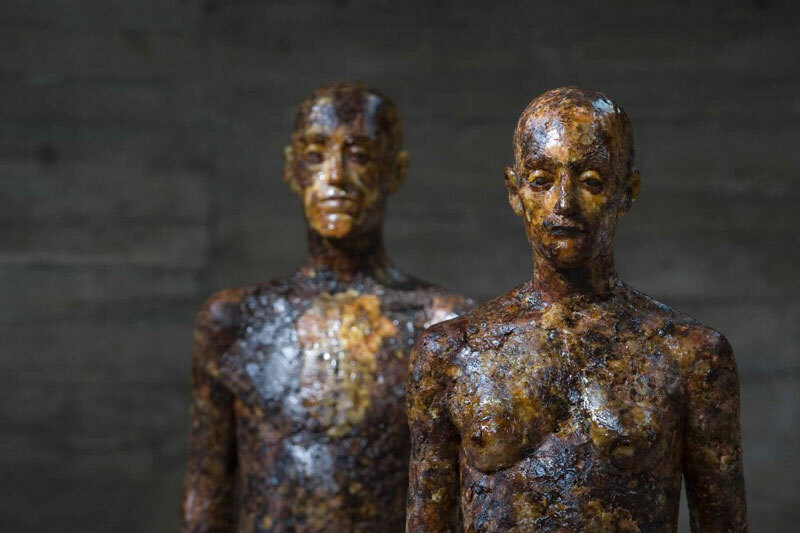 The charred remains of the artist's works evoke a new range of sentiments that delve deeper into the vulnerabilities of both the wooden materials they are composed of and the human figures they represent. Demetz's sculptures present mankind and nature as one, reflecting the fragility of both. The burned structures peel back the facade of the figurative forms and expose their susceptibility to hindering elements, both in the literal and metaphoric sense. The wood-turned-charcoal figures present an interpretive look at the outcome of physical and emotional onslaught. Expanding on his interest in the human figure, Demetz works with wood to evince conflicting notions of temporality and the quest for permanence. By reviving the religious tradition of wood carving that has flourished in the Northern Italian town of Val Gardena since the 17th century, Demetz brings a rich spirituality to his sculptures. Yet he simultaneously imbues his work with an oddly fitting contemporary touch by layering silver or aluminium foils or pouring resin over his figures. The resulting effect is startlingly truthful in capturing the complexity of the ties that bind us to the natural world. Demetz work has really interested me in the human form and it's relationship with nature his sculptures are beautiful but also have a powerful visual. That looking at them we can relate and see our own form that were comfortable with but as a still material that is expressing strong visual emotion. His works relationship between man and nature felt valuable in my research as it’s a relationship I’ll be exploring in this project. His use of different methods of manipulating the wood to express different moods appealed to my experimentation of natural materials I would like to achieve.